CH Nail #14 is a part of their neon collection. I picked this one, because I wanted something bright and pink. ^_^ I didn't know what to expect but when I tried it, I fell in love with. It's highlighter neon pink. <3 I really like its brush, because it's more on a flatter side, which makes application even easier. Formula is great, you can easily get away with 2 coats. I didn't use a top coat on the picture below, so you can see it has some kind of this plastic finish. I'm really happy with this polish and I'll be definitely wearing this one through the whole summer. I have no idea if these are B3F, because the ingredients aren't listed on the bottle, but this one doesn't stink like polishes with Formaldehyde, DBP & Toluene. It's $4.99 per bottle and the bottle contains 15 ml (with a cuopon code you get a nice deal :i ). And I'm still wearing this manicure, because I love it so much! :L What do you think? So I tried this double sided stamper for the first time and so far I'm loving it! It's much easier to hold it in hands and transfer the pattern from the plate to my nails. I also got the regular stamper from BPS and they're same size, the only difference is that the double stamper is smoother but it still picks the pattern perfectly as the normal one. Double stamper has a green smaller stamper for smaller patterns but I don't know if I'm ever going to use that one, because I'm really not a fan of smaller patterns. :D It comes with a metal scraper and I prefer credit cards more than metal scrapers, because they easily scratch my plates. Let me know if you already tried any of these! 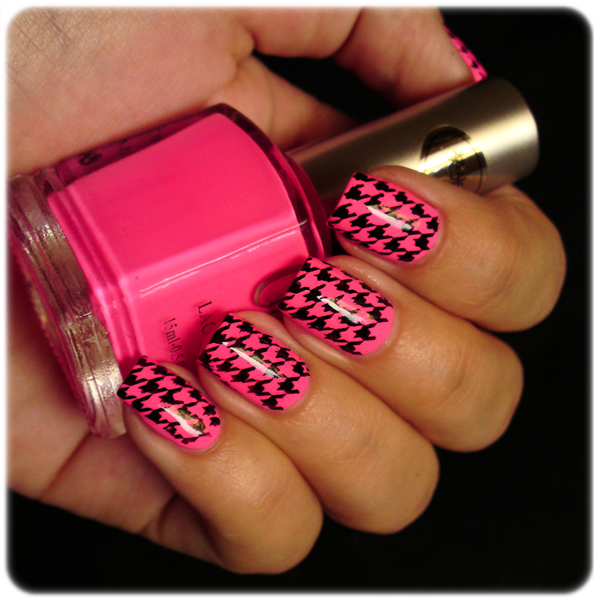 Do you like Houndstooth nails? ohhh lovely pink, love the stamp! Love it!! Neons look so good on you! Even this pattern fits perfectly...love it too!